When customers make payments on invoices you have issued them for jobs, you can apply these payments to the invoices in simPRO depending on your security group settings. Technicians can also process and apply payment to invoiced jobs in the field using Connect. If you have activated simPRO Payments, you can also apply payments made by credit card in the office over the phone or in the field using Connect, and customers can apply payment themselves online and through the customer portal. See more in Use simPRO Payments. If you handle payments externally from simPRO in your accounting package, it is still important to enter payment details in simPRO so that you can use statements, aged receivables, the accounts dashboard , credit limits on customers, keep track of outstanding invoices, and more. Once a payment has been applied to an invoice, it is not recommended to edit it or delete the payment, as it may have already posted to your accounting package. Go to Invoices > Unpaid Invoices. Click Options > Apply Payment. Click it, then click the Payments tab and click Add Payment. Search the customer name in the local search bar. Select the invoices and click Apply Payment below the table. Go to People > Customers. Click Options > View > Statement on the customer. Select the invoices, then click Pay Invoices at the bottom of the table. Go to Jobs > Invoiced Jobs. Click the ... button for the job. Under Unpaid Invoices, click Options > Apply Payment on the invoice. Import payments into simPRO through the accounting link if you use Xero or QuickBooks Online as your accounting package. Learn more in Adjust Xero export options /Adjust QuickBooks Online export options. You can then follow the instructions detailed below to complete the process or if you have activated simPRO Payments, Apply a payment by credit card over the phone. Select a payment Method, and enter a Deposit Account if it does not automatically populate. See Payment Methods for information on assigning deposit accounts to your payment methods. If your customers frequently pay by cheque, enter payment details in Profile > Settings > Banking so that when you next process a cheque from that customer, you only need to manually enter the cheque number. Adjust the Date, finance charge, Cheque No., and Notes as required. Adjust the Amount Applied as required. Select Archive Job to archive the relevant job after this payment is applied. You can then Email a payment receipt or click Finish to exit the payment. Apply a payment to an invoice and click Submit. Click View to preview the receipt, then return to the Forms tab. To learn how to adjust how the payment receipt PDF form displays, including how to adjust the form title, include a Paid stamp, or display a paid invoice as an invoice or receipt, see Invoice Forms. 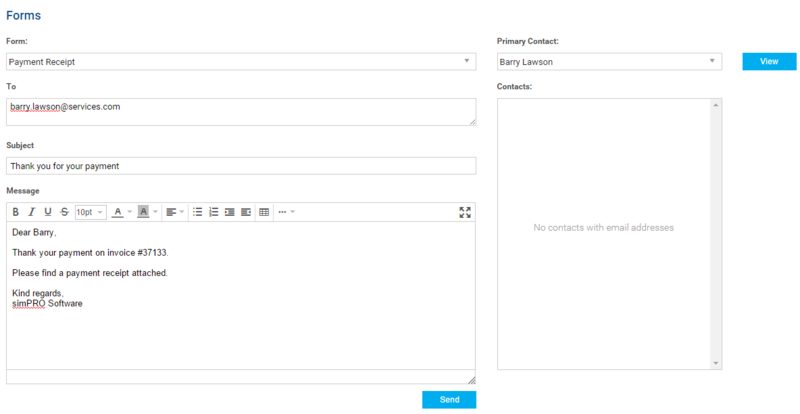 Adjust the default Subject and Body template if required, or click Clear Email to remove it and enter new text. Try Walk Me Through, our step-by-step guidance tool, to pay invoices and email payment receipts. In simPRO, go to Help > Walk Me Through and search Apply a Payment (ID: 84963) or Email a Payment Receipt (ID: 88119).